Molly's Pub & Shebeen, a Mainstay of Hard-drinking Third Ave.
First, I know that Molly's is not exactly an anonymous watering hole. Some treasure it as the finest Irish pub in the five boroughs. But, God help me, I've never passed through the squat Tudoresque frontage, so I figured it was high time I hoisted a beer at this mainstay of old, hard-drinking Third Avenue. The address, 287 Third, has held a bar since 1895, excepting Prohibition years—and even then, who can tell. The working, wood-burning fireplace was in place long before the joint was called Molly's (actually, Molly Malone's first) and long, long before present owners Peter O'Connell and John Ronaghan took over in the 1990s. The hearth is a big draw in the cold winter months. If you don't find yourself feeling cozy trodding the sawdust-strewn floors in this low-ceilinged nest of woody nooks, you don't know how to be cozy. The fireplace is cherished by locals, but a handfull to the management. "The chimney catches on fire pretty regular," the bald, spotlessly polite Irish bartender says. A chimney sweep is all but on retainer. Where does one find a chimney sweep in New York? The bartender shrugs. "The owner knows." The line of dark booths, peopled by a mix of familiars and tourists, are littered with just-served and just-devoured Shepherd's Pie. Molly's is known for the dish. Hamburgers, too, though no one seemed to be ordering them when I was there. To wash it down, there's Irish, Irish and Irish. Guinness, Harp, Smithwick's. Murphy's Stout and Murphy's Red are represented by two enormous taps. Don't look for Smutty Nose here. A wild-haired, grab-bag lady at the end of the bar is obviously an established barfly, a drunken barnacle unlikely to exit anytime before closing hour. But when a French lady sitting next to her digs into her Shepherd's Pie, the boozehound admits she has never tried the dish, and has no idea what it might be like. "You should," says the French woman, scooping up a forkful and handing it to the lush. She warily takes it, holds the hot, steaming food one inch from her month and says, "I might. I may taste it someday"—as if the matter were still in question. She tries some Pie, utters no verdict. Suddenly, the barfly, too, is speaking in French. The bald bartender, who has an Irish accent as thick as treacle, walks to their end of the bar. And he breaks in very passable French. 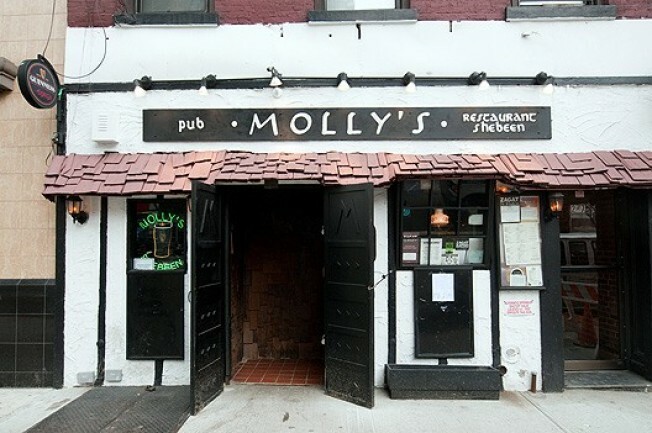 Gallic, not Gaelic, briefly permeates the air at Molly's Shebeen. A portrait of Brendan Behan, looking half in the bag (that is, normal), gazes down from the wall, no doubt amused. Behan never drank at Molly's, of course. Died in 1964. Seamus Heaney has, however. Booth near the door. Regular customer.